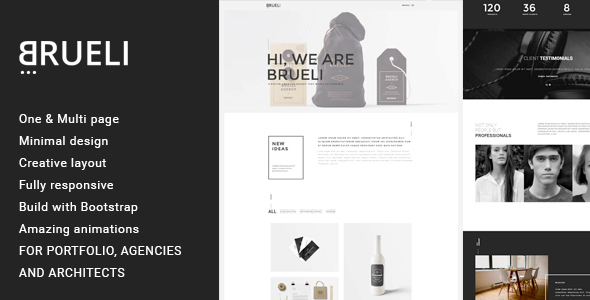 Brueli is a fully responsive One u0026amp; Multi page template designed and develop with a minimal design for Portfolio, Agencies, Freelancers and Architects. This theme is perfect for building an awesome website within minutes. Theme has a universal design, it thought every detail and animation effect. Its just as easy to customize to fit your needs, replace images and texts. Brueli with Three versions. You can freely choose according to their own. The WordPress theme is responsive, you can view it also in the mobile/tablets devices and it looks very in more devices. What are you waiting anymore let experience ” Brueli ” our theme. Compatible with Visual Composer 4.11.2.1, Visual Composer 4.11.x, Visual Composer 4.9.x, Visual Composer 4.9, Bootstrap 3.x. Brueli has been tested with browsers IE9, IE10, IE11, Firefox, Safari, Opera, Chrome, Edge.